← ANDREW GLIKSON. Methane, Coal Seam Gas and the demise of the planetary life support system. CAMERON HILL. China’s policing assistance in the Pacific: a new era? While there has been renewed discussion and debate surrounding China’s infrastructure assistance to Pacific nations over the last several months, less attention has been paid to China’s growing policing and law enforcement presence in the region. While still in its early stages, this presence spans several of the Pacific Island countries which recognise the People’s Republic of China (PRC) and, in some cases, has expanded beyond the provision of facilities and equipment to include training, secondments and joint operations. Of these countries, Fiji has the closest policing relationship with China. In April 2011, Fiji signed a memorandum of understanding (MOU) on police cooperation with China’s Ministry of Public Security. The MOU reportedly covers areas such as search and rescue, counter-terrorism, anti-money laundering, and combatting people trafficking and cyber-crime. This MOU has facilitated policy dialogue and two-way exchange programs between the Fiji Police Force (FPF) and its Chinese counterparts, as well as the secondment of senior Chinese police personnel from several provinces (including Sichuan, Hubei and Jiangsu) and the training of FPF officers in China. The PRC has also provided significant amounts of equipment to the FPF. In September 2014, China provided vehicles, as well as communications, surveillance and anti-riot equipment ahead of Fiji’s national elections. China’s ambassador to Fiji described this assistance as reflective of ‘the high level of political mutual trust’. More recently, China has provided CCTV cameras to police in Suva and Fiji’s police commissioner has requested surveillance drones from Beijing. In early 2018, China provided 50 police vehicles to the FPF. Perhaps the most high profile aspect of the China-Fiji policing relationship has been the growing operational cooperation between the two countries. Fijian police have sought assistance from their Chinese counterparts for the investigation of crimes involving Chinese nationals in Fiji. This cooperation was the subject of international attention in August 2017 when Chinese police arrested and deported 77 Chinese nationals from Fiji on charges relating to telecommunications offences and online fraud. In a joint statement, the FPF and the Chinese embassy in Suva describedthe operation as testament to ‘the two countries’ ongoing commitment to maintaining law and order in our own countries’. Subsequent Australian media reporting observed that the deportations may have been connected to allegations of human trafficking activities by Chinese nationals in Fiji. Some members of Fiji’s opposition also questionedthe lack of transparency and due process surrounding the operation. An extradition arrangement between the two countries received in-principle agreement in 2015, but a treaty does not appear to have been formalised. Beyond Fiji, China’s policing assistance in the Pacific has mainly been in the form of the provision of buildings, facilities and vehicles. In October 2016, China announced that it would fund the construction of a new police training centre in Samoa, one of several projects to be funded from a US$15.7 million Economic and Technical Cooperation agreement signed by Beijing and Apia. China has also funded the construction of the police headquarters in the Cook Islands and in early 2017, supplied vehicles, riot equipment and uniforms to the Vanuatu police. China’s assistance to Papua New Guinea’s police appears to be more modest. China has provided police vehicles to support PNG’s hosting of the 2018 Asia-Pacific Economic Cooperation (APEC) meetings. Australia remains the leading external law and justice partner in the Pacific, with large and established police cooperation programs in Papua New Guinea, the Solomon Islands (which does not recognise the PRC), Vanuatu and the wider region. The estimated $100 million which Australia is providing in support of Papua New Guinea’s hosting of APEC in 2018 includes a substantial policing and security component. However, China’s increasing assistance does reflect a broader trend in the Pacific—a greater number of external powers are pursuing diverse interests and increased influence in the region and Pacific Island countries are attempting to leverage this to advance their own strategic, economic and development goals. Indonesia, for example, is also providing some policing assistance to Pacific Island countries. It is not clear at this stage whether China will seek to replicate in other Pacific Island countries its close policing relationship with Fiji. Australia will be watching the evolution of China’s regional policing relationships closely and there are some areas of mutual interest, such as combatting drug trafficking. However, China experts such as Dr Graeme Smith from the Australian National University have warned that Canberra should be wary given the Chinese authorities’ domestic security practices and very different approaches to the rule of law and transparency. There have also been concerns in Australia and other countries regarding the alleged covert rendition of criminal suspects by China. 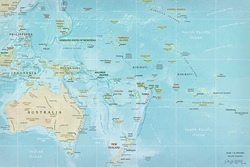 Seen in this context, the announcement in the 2017 Foreign Policy White Paper of a new Australian Pacific Security College to ‘deliver security and law enforcement training at the leadership level’ may reflect a renewed desire on the part of the Australian Government to work with Pacific Island countries to ensure values such as rule of law and transparency are strengthened as new players emerge and as the region confronts more complex transnational crime and security challenges. This article was first published by the Parliment of Australia on the 6th of April, 2018. 2 Responses to CAMERON HILL. China’s policing assistance in the Pacific: a new era? Had Australia played a disinterested (not “self-interested”) role in being a good friend and partner with all those island nations in the Pacific region (not “our region”) region – rather than its patronising/bullying Big Brother/Deputy Sheriff and/or exploitative role – then there may be reason to feel concern that a “bestie” (best friend) relationship was being doomed as another moved into that role. Here China is being seen as the new “bestie” – but one can hardly blame our former “taken-for-granted” mates being enticed by this new and very powerful friend. It is equally patronising of Australia to imagine that the various Pacific Island nations are not intelligent enough to understand that nothing is for nothing (Australia has taught them that self-interest exists for the big player in relationships with them – for resources or international “coalition” blocs) – that what they might receive from China will not have some quid-pro-quo sub-text. Think Australia – and the way it gives its all to the big-player mate it loves to court – spy bases, military bases (Darwin) Free (US calibrated) trade deals – blah! blah! blah!. Grow up Australia – look after all our neighbours – as equals!